There is some good white wine to be found in Spain. In Galicia, the most north-western part of Spain, Rias Baixas can be very good. The wines are made from the Albariño grape, and many are cold-fermented to maintain freshness. And also Ribeiro. Further to the east, and just a little south, is Rueda. The reputation of this DO once rested on the flor-influenced sherry-like wines it produced, but it is now the home of some more examples of very good Spanish white, this time made from the Verdejo grape. La Mancha DO. Macabeo. Long fermentation at low temperature to prolong the maceration. Pale yellow with green hues. Fine varietal aromas with a balsamic background. The palate is well balanced and fresh. This is one of the cellars of La Mancha that more is being renovated and adapted to modern times. Rueda DO. Made from Verdejo grapes from vineyards of average age 25 years. TPale golden color. Clean and bright. 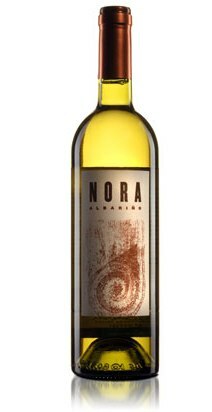 Light and delicately scented nose with aromas of fennel (aroma typical of the Verdejo variety.) The palate is dominated by notes of green apple and banana. Rueda DO. Verdejo grapes. The Sanz family is one of Rueda's best known producers, and their wines offer a very good price-quality ratio. Their Verdejo is pleasant, fresh and light, a quality white wine ideal for everyday drinking and perfect for keeping you cool during the summer! Rueda DO. Verdejo, Sauvignon Blanc and Viura. Straw yellow edging verdoso. Intense in nose, with the complexity of the grapes, fresh aromas of grass, white-fleshed fruit pulp colour. Very nice sensations and mellow aromatic that make fragant. Well balanced in palate, It leaves a fresh feeling encouraged. Rueda DO. A lovely, crisp and floral Verdejo (Spain’s finest white grape variety) that is produced bio-dynamically from 40 years old vines. R. Parker gave the 2007 vintage 90 points. Pale greeny, golden in colour and a very floral nose with hints of fennel and tropical fruit. Full bodied, dry, concentrated and wondefully aromatic- with flavours of apricots, greengages and a touch of almonds. A very long finish. Excellent value for money. Rueda DO. 95% Verdejo 5% Sauvignon Blanc. Everything about this wine screams freshness and zing, which is enhanced by the 7% Sauvignon Blanc, the Stelvin Lux screwcap and the absence of any oak – you can use oak on Verdejo, but like most people I favour the fresher approach. The fruit here is beautifully ripe which gives the merest hint of creaminess to the palate to balance the zesty qualities, there are herb and grassy nuances too leading to a long finish. The body is given more depth and roundness by a touch of skin contact during the winemaking, so leaving the merest trace of tannin across the tongue. Rueda DO. 100 % Verdejo. Vineyards of over 10 years of age, belonging to the property of La Seca, in Valladolid, in the heart of the Ribera del Duero. Handpicked at night. Fermentation in stainless steel tanks. Elaborated with the latest technology but staying true to tradition. Tasting notes: Straw-yellow color with greenish hues. To the nose, fresh, fruity, hints of apple and tropical fruit, herbal notes.To the palate, fresh, round, fruity, good acidity, with a slightly bitter finish. Rueda DO. Rueda’s smallest producer, using 60 year old organically farmed vines. On the nose, youthful, medium+ to high intensity, grapefruit, kiwi, peach, citrus, honeysuckle, floral component, lots of mineral, and no oak. On the palate, dry, laser like acidity, bright fruit, minerality, with a long zesty finish. Impressive wine that reminded me of New Zealand Sauvignon Blanc, with very attractive price-tag. Rueda DO. Verdejo. Lovely aromatic grassy/herby nose. Very intense and fruity with a distinct grassy edge. The palate shows a good density with a rounded fruity character. A nice example. Very good/excellent. Rias Baixas DO. Albariño. Colour: Bright yellow with green reflects. Aroma: Powerful, complex and subtle aroma, with a smart presence of floral notes. Taste: In mouth it is round, tasty and persistent, with an excellent balance as a whole. Food recommendations Ideal to share with fish, seafood and meals served with vegetables. A perfect albariño from de Rías Baixas vineyard, with an atlantic weather and a perfect microclimate for the maduration of this unique fruit. Rueda DO. 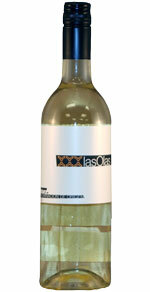 Las Olas is a blend of 70% Verdejo and 30% Viura from Rueda, and is a great refreshing bottle of wine. Fermentation in stainless steel gives it such a clean and vibrant feel on the palate. It is pale yellow in color with intense fruit. Light and crisp, with mineral notes and herbs sailing on into a long finish. Rueda DO. Made from 100% certified organic Verdejo. Stainless steel fermentation. Vineyards located at a height of 800m above sea level (2624 feet). Yellow pale, greenish rim. On nose, intense reminiscences of minerals with herbaceous notes over a background of white fruit and citrus. On palate, smooth, good acidity level, fresh and elegant. Excellent final expression. Rueda DO. Verdejo. To produce this wine are used strains more than 40 years of Verdejo. The Sanz family is one of Rueda's best known producers, and their wines offer a very good price-quality ratio. Their Verdejo is pleasant, fresh and light, a quality white wine ideal for everyday drinking. Ribeiro DO. Treixadura, Torrontés, Godello, Loureira y Albariño. Bright straw yellow with green hues. Aroma of medium to high intensity, very fine and elegant with tropical fruit notes of fresh grass. Mouth very balanced, tasty and fresh, formed a pleasing and harmonious whole. Rias Baixas DO. Albariño, treixadura and loureiro. Young wine. Bright straw color, aroma, green fruits, herbs, ripe mouth, fresh, something greasy, excellent acidity. One of the Rias Baixas with more personality and character. Perfect for fish and seafood. Rueda DO. Pale yellow color with steely highlights in its rim. Aromas of tropical fruits like Mango and the fruit of the passion. Powerful aromas and very varietal. In the mouth, it is fresh, smooth, elegant with a great persistence finish. Rias Baixas DO. Albariño. Yellow, shiny, straw-green hues of ripe lemon and slightly bubbly. Intense and elegant nose, to perceive aromas of fresh herbs rocoy Hmed of a pleasant scent of apples: Lane. Cool and refreshing in the mouth, persistent, large, tasty. Ideal for seafood, fish, poultry, rice, and fresh cheeses. Made entirely from grapes from their own vineyards, taste the pure essence of the varietal: an aromatic grape with a high level of sugar and a high degree of acidity gives this wine freshness. Ribeiro DO. 70% Treixadura, 9% Godello, 9% Loureira, 7% Torrontés and 5% Albariño. Sanclodio is owned by Award winning Spanish art film maker Jose Luís Cuerda. San Clodio, named for the monks that cultivated the land for centuries and their former monastery down the road from the property, San Clodio. Rias Baixas DO. Albariño 100%. Hand-picked harvers. This wine offers genuine varietal flavor and beautiful balance. Like so many wines made from this grape variety, the wine tastes fresh and lively, with fruit flavors that echo peaches and apricots. Rueda DO. Verdejo. A wine made from the oldest vineyards with vines over 100 years, even pre-phylloxera, and using the more traditional method of vintage and winemaking that provide all the elegance and balance the Verdejo. This is a small and exclusive production born as a tribute to the 75 year life of the winery. The Cuatro Rayas Centennial Vineyards offers one of the most authentic expressions of the Verdejo grape, with its characteristic touch herbaceous and bitter end. Best served at 8 ° C, accompanying fish and meats in sauces soft. Rueda DO. 100% Verdejo. The history of this winery goes back to José Pariente, whose passion for more than forty years was to grow Verdejo grapes and make his hand-crafted wines.His daughter Victoria inherited his same passion and after specialising in oenology and viticulture, decided to continue the family tradition. Fermented on its lees in new and one year old French oak barrels. Bright yellow straw colour. On nose, powerful, complex scents of ripe fruit. Light notes of exotic fruit and minerals. On palate, pleasant and well balanced. Rueda DO. Verdejo. This is the first of the wines from the Belondrade winery, and one of the best white wines in the country. A mature, elegant white wine inspired by the Burgundy whites, that has in fact surpassed all expectations when it comes to quality from the Verdejo, the indigenous grape varietal of Castile. The wine has also undergone diligent ageing in oak of the highest quality and will continue to develop most favourably in the bottle for a further seven to eight years. Rueda DO. 100% Verdejo. Certified organic. Handpicked in boxes of 15 kg. Rigorous inspection at selection table. Whole clusters, without de-stemming. Remaining after alcoholic fermentation in French oak barrels - 20% new, 40% wine and 40% from two wines - to be completed with nine months of ageing at Burgundian style. Rias Baixas DO. Albariño. Pale straw color. Greedy nose with hints of honey, tropical fruit like Piaye Lichy or touches yellow plum compote. The palate is glicrico, with a strong acidic character and excellent electrical path. In the retronasal smoky. Valdeorras DO. Godello. Aged for 8 months in barrels on its lees. Greenish lemon yellow. Complex nose, grass, roasted nuts, fruit, excellent ripeness and nice touch aniseed. The palate is broad, flavorful, meaty, serious and elegant. Balanced and fresh. Final electrical with pleasant bitter taste. Unctuous and structure. You can keep well in the cellar for three or four years. Rafael Palacios is the brother of Alvaro Palacios, oenologist of great wines.